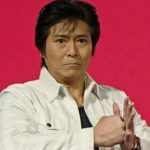 This topic contains 33 replies, has 12 voices, and was last updated by c0 1 week, 1 day ago. After spending a lot of time building, improving and using 3D printers, I finally wanted to get into the other end of manufacturing: subtractive manufacturing. So I needed a CNC Router and a printable one came in very handy. 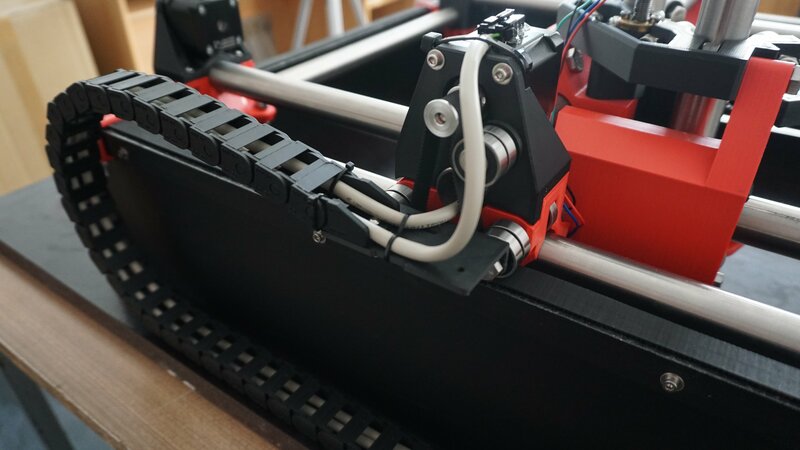 Although I did some modifications to the original version, the MPCNC itself is a beautiful and thoughtfully designed machine. Big thanks to Ryan for making this possible! I also made a small video about the things that you probably won’t find on a normal build. Maybe somebody can find some inspiration ;). The double belt setup is most likely the most exotic modification I did. Meanwhile I doubt that it is going to give any significant advantage over a single belt for my built. But it looks pretty nice :). If you haven’t heard of using two belts before: The lower belt acts like a track, where the upper belt rides in. 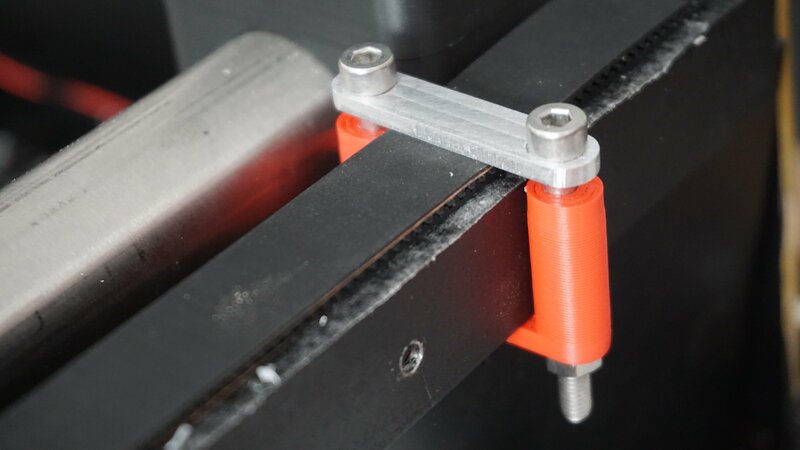 By using two idler bearings which press the upper belt into the lower belt, you can create two anchor points right next to the carriage instead of having the belt fixed at both ends of the machine. Therefore you effectively have a much shorter belt and hopefully less belt stretch aswell. My spindle is going to arrive in the next days, can’t wait to finally make some chips ;). That is one clean build….spindle needs to hurry up to get that thing dirty! Upper one is the AMB 1050 FME-P, the other one is the MM-1000 from Stepcraft (which is actually made by Mafell and is nearly identical with their FM-1000). Both of these are great spindles and most likely will feel unchallenged by everything I do with them on the MPCNC. But the MPCNC probably won’t be my last CNC router and I wanted a spindle that I could carry to the next one. Oh, and let’s be honest: the color scheme of other spindles like the RT0700 just really wouldn’t fit in :D.
The FME-P got a detachable cable and better soft start (not that important for using it in the MPCNC), but it does smell a lot more when running. The MM-1000 got a slightly bigger RPM range: 4000-25000 vs 5000-25000. 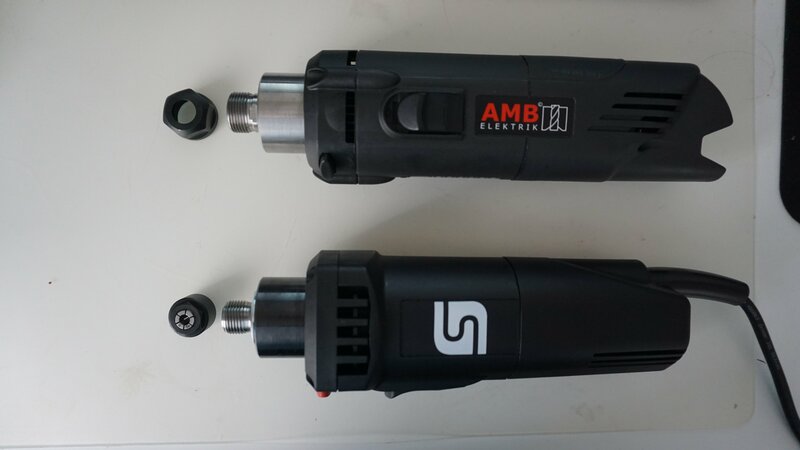 A big difference are the collet chucks: The FME-P uses ER16 precision collets with a dynamically balanced nut, the MM-1000 uses proprietary collets (although these are the same ones as the other AMB models like the FME-1 are using). In the end I think I am going with the FME-P. The detachable cable makes it easy to install/ exchange for any other tool and the ER16 chuck gives me a lot more freedom and seems more futureproof for further CNC adventures. As this is my first time working with this kind of stuff I would be very happy to hear your opinions. I think you did a great job with your setup. I found your video on YouTube when I considered building a CNC. 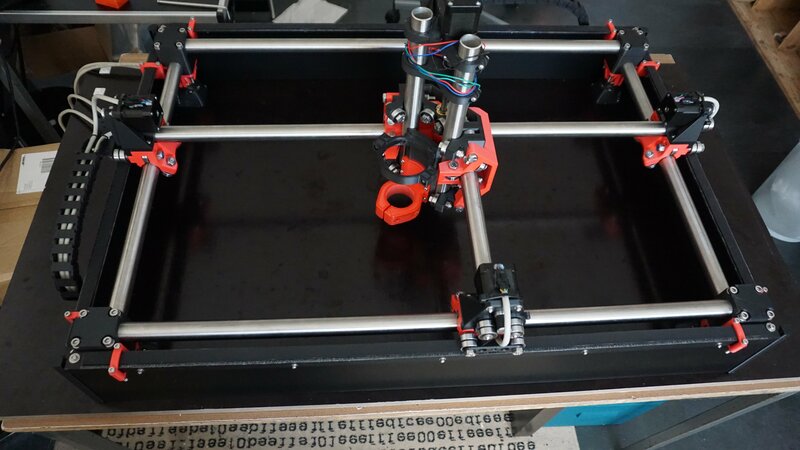 Now I just started building my MPCNC and would also like to use the double belt setup. Since it seems to me, that you therefore redesigned a few parts, would you mind to post them, so I don’t have to do it myself 🙂 ? right now I am not 100% satisfied with the parts I designed. So I first want to make sure that they work as intended, then I am definitely going to publish them. If you need help in redesigning your parts, let me know. Even if I only have very little experience in 3D modeling and mechanics in general, I would help where I can. I started out slow with foam board and made a lot of wood chips. Meanwhile I also tried some plastic and today I did my first cuts in aluminum. 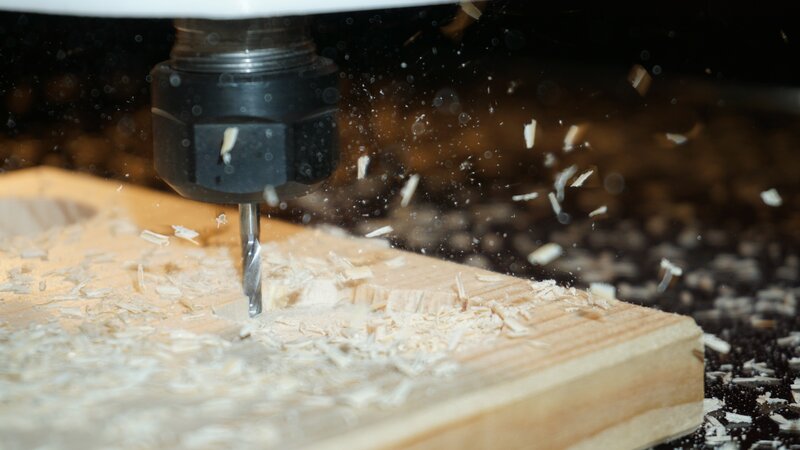 The MPCNC just cuts through everything without complaining (Although I am taking it relatively slow right now). I am going to post some results in the next days. Next the machine has to move to the garage where it gets an enclosure and a dust collection system. Those chips really fly everywhere! @Brine Thanks. After partly redesigning some parts the whole setup works very well for me. One problem right now is that the 15mm belt takes a lot of force to be tensioned. 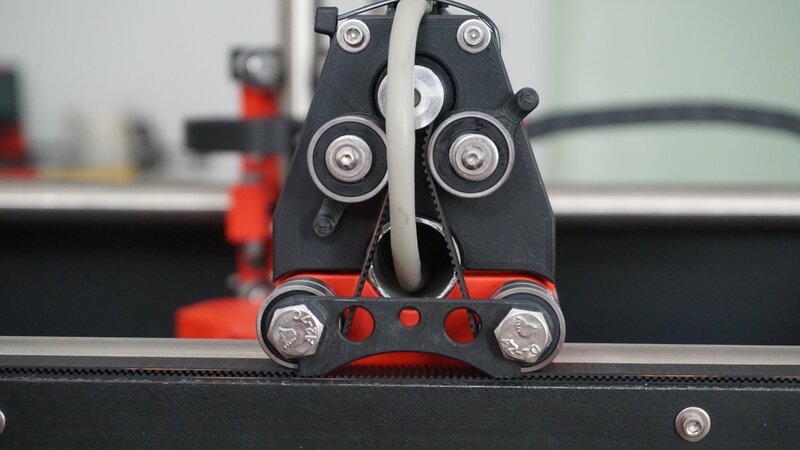 That puts much stress on the motor bearings as well as on the printed part and it seems like it does flex a little bit. Maybe it would be better to use 6 or 9mm wide belts. Thank you very much for sharing your redesigned parts. 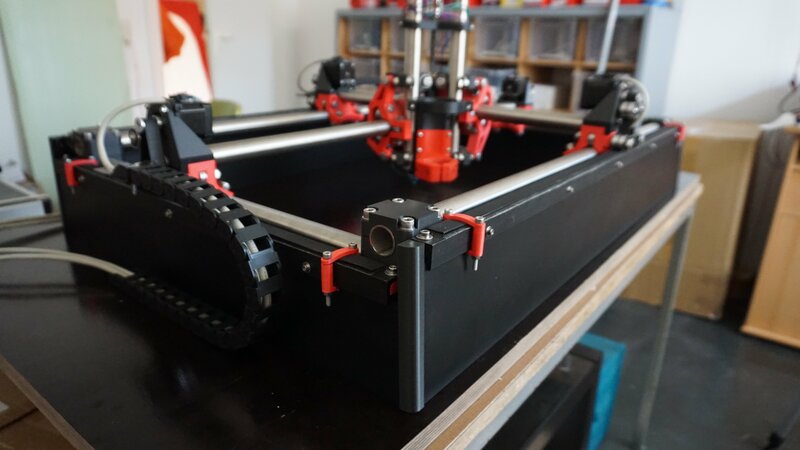 Can’t wait to finish printing all the required parts and start building my own MPCNC. I will defenitely go for the double belt setup, even though I ordered a 6mm belt. I will share my experience with the 6mm belt, so we can find out if it puts less stress on the parts. I concur, I hadn’t taken the time to check them out, but I’m now subscribed. I’m waiting for new videos 😉 And great work on the double belt setup ! A small question : now, you also need to adjust the bottom belt support against the upper one. How do you do that ? Still I am very happy with my machine and the results I am getting. 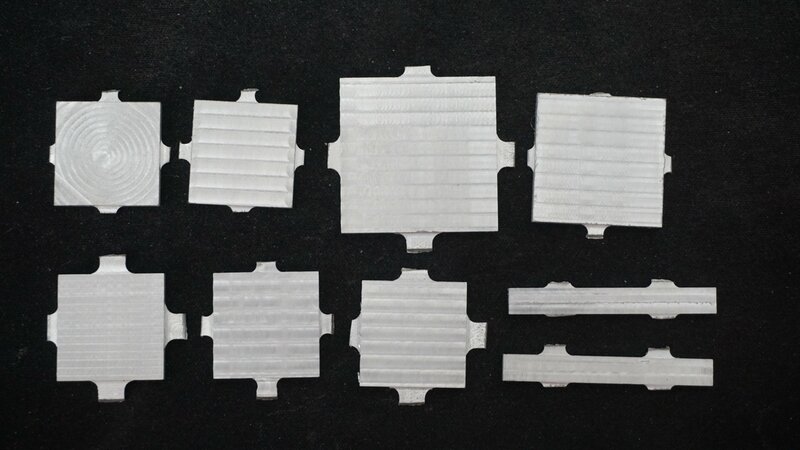 0,05mm tolerance in aluminum with a 500$ CNC router… amazing! @thesfreader Good question: It is very important that the two belts sit closely together. I 3d printed some rectangles with a hole and placed them between the angle iron and the mounting block on the corners. I printed them with different heights (0.1-1.0mm) and tried until I got a nice fit. But you could use basically anything (washer, aluminum foil, …) for that. Great results. I would say if you can feel anything on the surface triple check if your spindle is perpendicular. 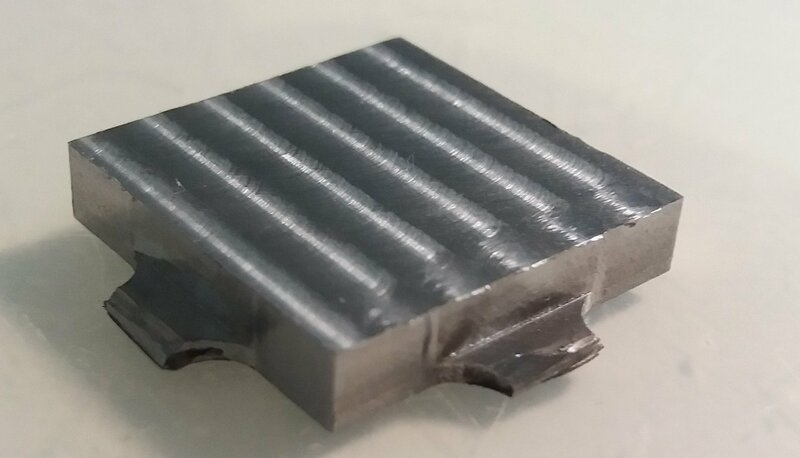 Sometimes just a tiny shim will fix that. I don’t know if I am reading this image correctly, but there is no sharp edge between the tool marks of the two toolpaths, instead they “flow” into each other. Therefore my spindle should be perfectly perpendicular and the ridge I can feel rather has to do with tool deflection, vibration or other nasty stuff. It is definitely the best surface finish so far and if it becomes a consistent result I would be a happy man ;). Thanks for the advice Brian. The foam tape is only there to prevent scratches on the spindle housing from the hard plastic and is basically completely compressed after tightening the upper clamp, but I am going to check if it allows any wobble. Tramming the spindle seems like the way to go, but right now my spoilboard most likely isn’t flat. It is bigger than my work area so I can clamp down larger pieces, but I can’t surface it without leaving a ridge on all sides. I am definitely going to get me an additional spoilboard which fits into the work area. But before that I want the MPCNC to be in its final location, bolted onto a new table. Then it’s time for the fine tuning you suggested. 1)In the picture you can see that there are small notches to the right and left of the tabs. 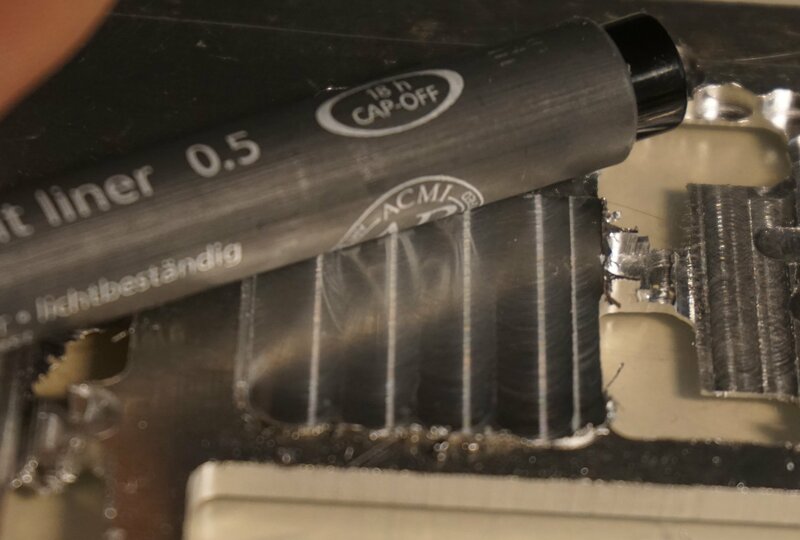 I suppose that these are caused by the end mill when it lifts up and down, so does anybody know of a setting in Fusion 360 to move the end mill away before lifting/ lowering it in 2D contour operations? 2) I use a helix with a low angle to ramp down into the material, however, especially in steel, that causes a lot of chatter. What do you guys use for metals like aluminum or even steel? I am a little at a loss for the plunge as well. I am not sure if it is a pathing thing or maybe a different endmill. I tried a small ramp in and a straight plunge neither worked that well. I think a better plunge cutting endmill will help. I will add it to my list of things to work on. I do know even on big machines where possible they come in from outside the material and do not plunge unless absolutely necessary. Freaking steel, I had no idea how wrong everyone was but steel is not actually all the difficult to do on the MPCNC once you have some basics under your belt. Congrats and welcome to a very small club of Steel Cutters! 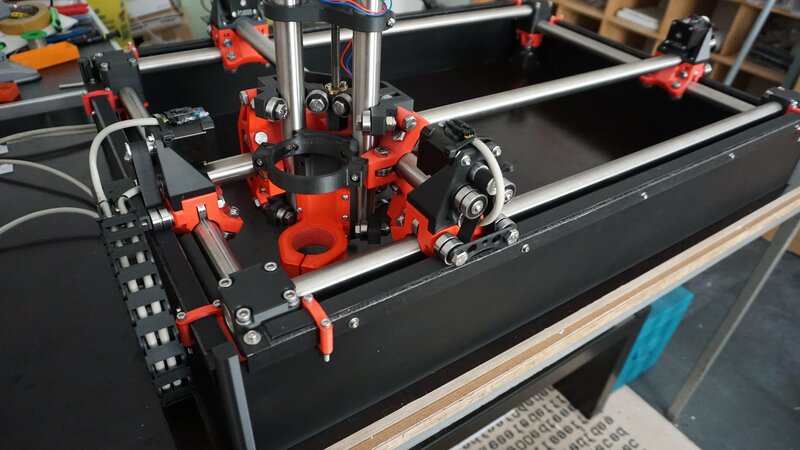 I am new to this form and have built a few CNC Routers stemming form the buildyourcnc world. I discovered the same issue around the holding tabs and think it is from the deflection of the spindle under load. When it stops to lift it routs into the piece as it pulls up. 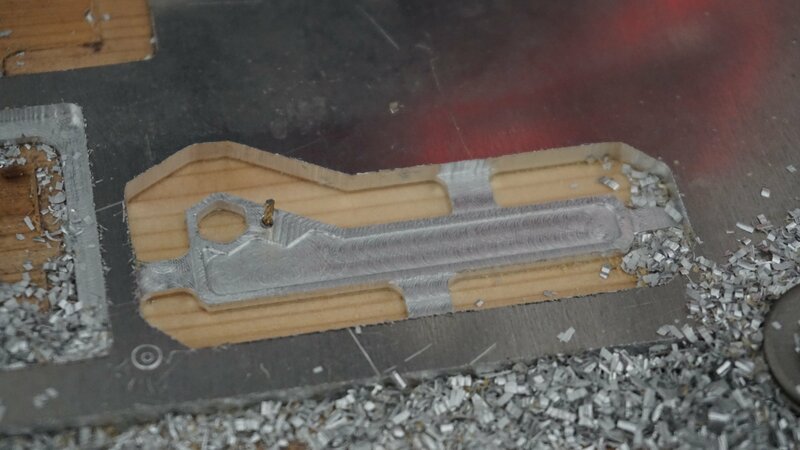 I was using a CAD/CAM program called CamBAm and it has an option for triangular holding tabs. with these the linear motion is continuous and the deflection stays the same. Also they are easier to cut out. Not sure about your cam software but I bet there is something like that around. Fusion 360 has exactly the same setting and I am going to try this as soon as possible. Thanks a lot! @mike Triangular holding tabs really help a lot. Thanks again! So far I still haven’t found a way to plunge into steel without an excessive amount of chatter. Predrilling the entry positions makes it a lot more enjoyable. Sorry Ryan, you fixed the video while I was also editing it, but I crashed it again. Could you fix it one more time please. 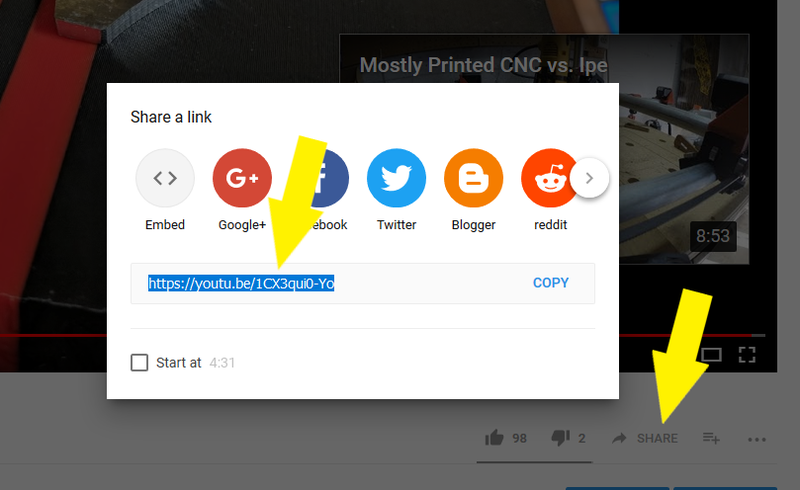 Just cut and paste the share link, no need for the embed stuff. Wow nice cut settings, that’s 5mm DOC in steel? I need to try steel out soon..
That CamBam program allowed me to do a ramp in on a cut. It would slowly ramp the bit down into the material so that it was not a straight plunge. Thanks again for the advice Mike, but I already tried that and all the other settings Fusion offers me (helical and “zigzag“ ramp). 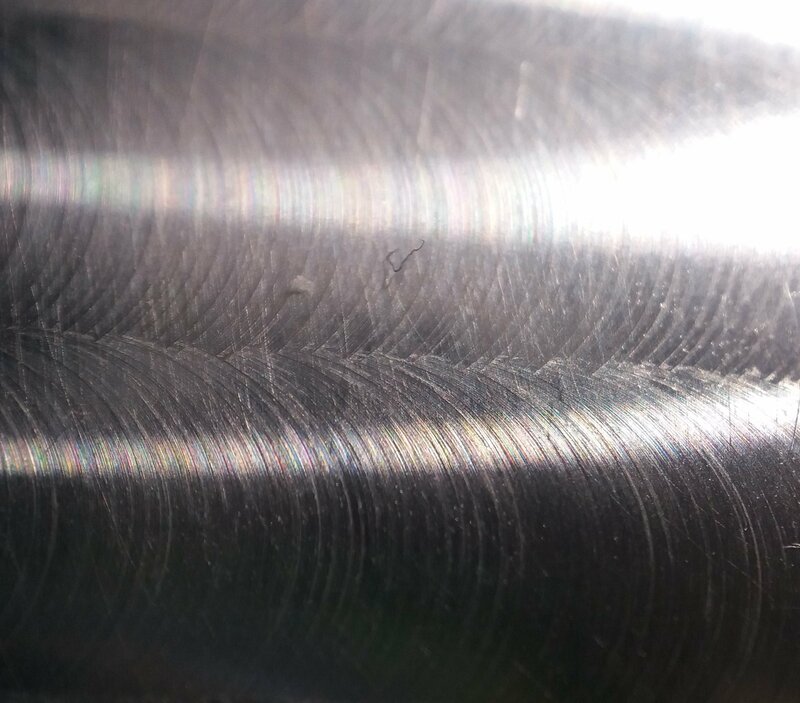 However I tested a single flute end mill and it ramped into the steel nearly flawlessly. But it is uncoated and I feel like the coating on the other end mill (I think it’s TiAlN) helps a lot. Cutting with the uncoated one creates much more heat and not so good looking chips. A coated single flute end mill would be great, but I can’t find one (for little money 😉 ). 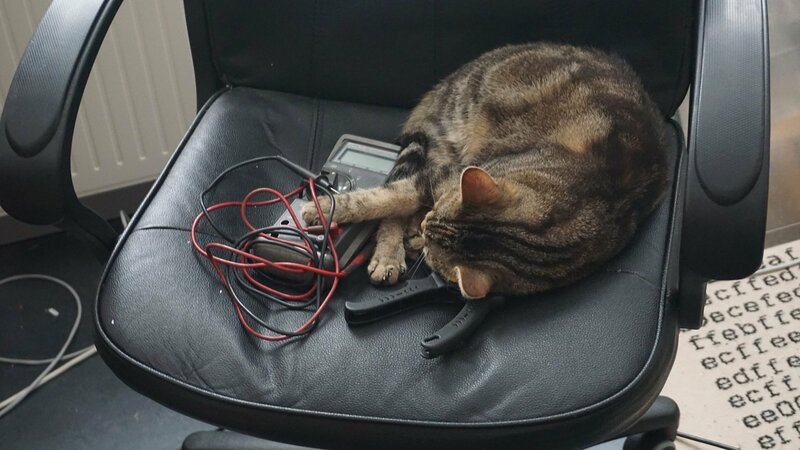 Evan, make sure that your vacuum catches all the steel chips or use an enclosure, those chips are razor sharp. I am very interested in your experiments with different tools on steel and aluminum. Good luck with that. Glad to hear you’re finding luck with the single flute. I’ve also been searching for coated single flute tools without much luck. All I’ve found is a TiN coated ebay special ($6) which I am guessing is junk grade carbide but I’ll try it anyways, and Datron has a proprietary coating but it’s aimed at cutting bronze. I’ve been using a vacuum so far that does alright but getting serious chip evacuation issues in 3/8″ material, so I bought a compressor and have some loc-line that should arrive today. I need to put some plexi shields around the machine to keep the mess localized. If we’re having real issues with uncoated tools I can ask my tool guy about getting someone to coat some of the Kyocera ones we use. I don’t know how expensive it will be or what kind of quantities are needed to make it viable. I’ve just been looking through come catalogs & Microcut makes some swanky looking single flutes, they might be willing to do coated specials. Even the uncoated ones are $30-40 though. Hard to beat the cost and quality of the Kyocera tools, all the high end stuff I’m looking at is rather pricey for small tools. If you have trouble with plunging, what you could do is to first use a regular drill bit for making a hole, and then come back with a milling bit to do the rest, starting from this hole. I think that’s pretty much the only method unless you find some kind of fancy bit.